Groundhog removal is one of the most common calls Weaver’s Wildlife Control gets. Groundhog control is necessary. 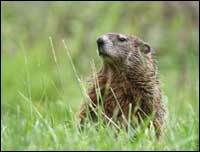 Also known as woodchucks or whistling pigs, these are very pesky animals and can cause a tremendous amount of damage to grasses and shrubbery. Groundhogs have heavy bodies with short and strong legs. Curved claws on their front paws make for easy burrowing. Groundhogs have four toes on the front and five on the back. The closer it is to autumn the fatter a groundhog will become as it prepares for the upcoming winter. Groundhogs weigh an average of eight pounds and can eat approximately 1/3 of their weight in vegetation each day. A groundhogs diet consists of grasses, clover, garden vegetables, leaves, twigs, apples, berries, and dandelion. In your garden the groundhog seeks beans, peas, herbs, strawberries, pansies, and impatiens. They are members of the squirrel family and are found in the great bulk of the central and eastern US. Groundhogs usually live 2-3 years in the wild, but have the ability to live up to six years. They have great eyesight and very sensitive hearing. Groundhogs can remove 700 pounds of soil to complete a 20 to 25 foot long burrow with multiple chambers. 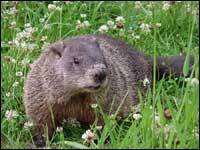 Groundhogs are herbivores (meaning they eat plants) and can also cause significant damage to lawns and flower beds. They will completely destroy plants and are famous for digging holes under homes and sheds. This in itself is very dangerous as structural damage will occur as this animal digs under your shed or deck, causing the structure to either shift or fall. If a groundhog starts to excessively dig around the foundation of your home or building the results could be costly. Once a groundhog opens a hole in the ground, this gives a place for water runoff and rain to seep into, this act of erosion will spell serious consequences. Groundhogs are one of the more elusive creatures that Weaver’s Wildlife Control tries to manage. Since groundhogs are herbivores, as mentioned earlier, the type of bait used to trap these critters must be chosen carefully. They will not be tempted by regular food baits used to lure raccoons, squirrels, skunks and most other wildlife. Weaver’s Wildlife Control uses specialty baits that resemble the food source they naturally eat. We carry specialty baits that contain persimmons and cranberry bases. We have years of groundhog expertise and fully understand just how finicky they can be. We also handle Muskrats and Nutria upon request. Weaver’s Wildlife Control is ecologically responsible, ensuring that only environmentally sound solutions and humane wildlife removal techniques are used for all groundhog removal situations. We provide groundhog removal services to homeowners, property management companies, local municipalities and communities. Call us today at (757) 725-1558.